The Myth: Rosé that is dark in color is sweet. The truth: Rosé wine gets its color from skin contact, not sugar content! Darker rosés may remind you of pink drinks like the artificially flavored, sickly sweet White Zinfandels, but the reality is that a quality rosé, even if it is dark, will contain neither added nor residual sugar. All grapes, no matter their color, are juiced. Wines receive their color not from the juice but from the juice’s contact with the skin of the grapes. As the skins and the juice soak together the color from the skin bleeds into the juice, giving the wine its yellow or red color (or pink!) color. This process is known as maceration in the wine-making world. 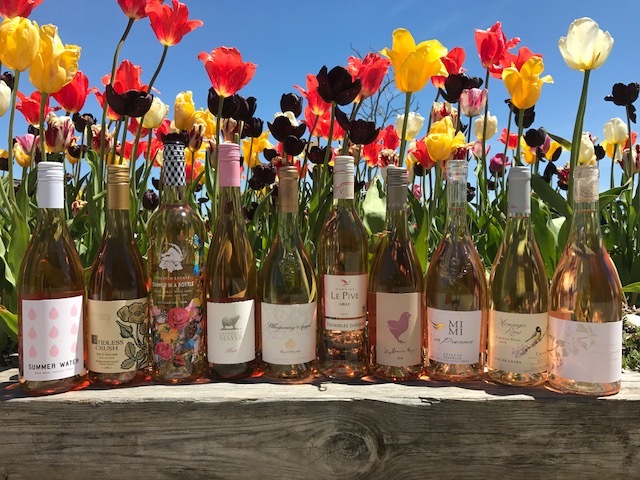 While everyone may love the taste and appearance of light colored French rosé, the reality is that you are missing out on some really amazing wines. Additionally, a quality rosé could be pale pink one year, and a darker shade the next. This natural variation is something I actually look for as a sign of quality in rosé and that human hands were in contact with the wine making. Conversely, a rosé that is consistently the same exact color every year makes me wary that computers and machines had more of a hand in manufacturing a product, versus creating a beautiful living thing, which is how wines should be considered. Real people make real wine, and real people make these rosés of all colors, tastes, textures and flavors. You owe it yourself to give these wines a try. Raimond de Villeneuve’s impressively beautiful, biodynamic vineyard (Want to know more about biodynamics? Click here-http://www.winespectator.com/drvinny/show/id/41226) is situated in an amphitheater, thus having a very special microclimate. Château de Roquefort is at an altitude of 1000 feet, allowing later harvesting, which results in more freshness and complexity than is usual in Provençal wines. The 29 hectare of vineyards are located on the edge of the wildly popular Bandol appellation. Both smooth and beautifully fruity, this is a balanced, delicious wine. It is full of wild strawberry flavors, fresh acidity and a crisp finish. It’s a good choice with food such as brie cheese with fruit compote or marinated olives and charcuterie or simply as an aperitif. When Kathleen Inman harvested Olivet Grange Pinot Noir on the same date as her 20th wedding anniversary, she decided to celebrate the occasion by setting aside some of the Pinot Noir harvest to craft a special rosé. Hence the birth of “Endless Crush”, and ode to her never-ending crush on her husband. We have been a fan of this small production rose for a few years now, and this year is no different. A tart spiciness and floral strawberry qualities work well with slightly richer dishes (think risotto with shrimp and lemon zest). Refreshing and clean, it can easily hold up against even the most sweltering summer day. 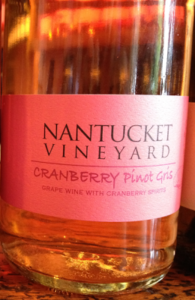 Vinified from Pinot Gris grapes from Washington State and 1,000 lbs of native Nantucket Cranberries, this wine opens with crisp effervescence, juicy fruit and lively acidity. The addition of cranberries are what gives this wine its deep pink color. 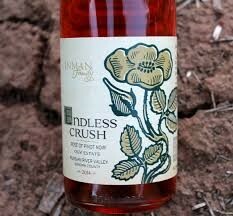 This rosé is a low-key, scrumptious libation complete with a beer bottle pop top, perfect for all occasions.